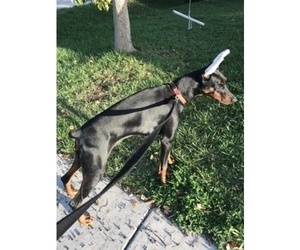 Champion origin, female Doberman named Diona, need new home because of professional development abroad. The dog was born on May 4, 2016. Dog's ears was cropped and his tail was docked, while she was still a puppy. Was regularly vaccinated and cleaned of endoparasites. In the summer dog gets regular protection against ectoparasites. 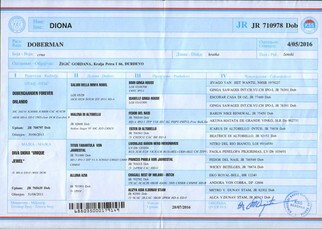 It is chipped and registered in our kennel Dobermannzuchthaus von Schwarzenberg which I own. The dog was tested for transmissible diseases-vWD clear and DCM negative. She was tested on hip-elbow displasia witch is A0. 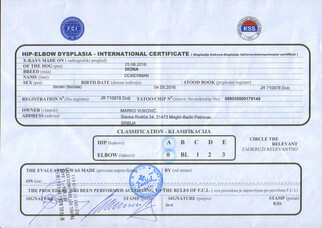 It was evaluated with excellent grade by the Serbian Canine Association. Only premium food was used to feed her, with the addition vitamins, minerals and oligoelements. Dog's osteo-muscular structure is in perfect condition and mentally balanced. She is socialized and used to young children. It does not attack other pets and dogs, it does not react to walkers and other dogs on the street. She is very calm and obedient. It is trained to walk on leash. Likes to ride in the car, or when I take her for a run by the bike. It is very reliable guard dog, protective of his territory and warns at strangers. Dog is kept in the yard at all times and regularly taken for a run (winter time also). It tolerates cold weather very well. As a doctor I care greatly to be in perfect physical health, because the dog is in contact with our children (youngest is a 1-year-old baby). It behaves protective towards children and loves to be around them. The dog lives with us as a pet, in ideal conditions and has a large yard with enough space. Unfortunately, we are moving to Switzerland, which prohibits importation of cropped and docked dogs. In addition, there is not enough space for a big dog. We are sorry that we can not keep it with us and we would like her to come to a pleasant environment among people who sincerely love animals. The dog is suitable as pet, guard dog, or for kennels, because her mother and aunts had in average of 11 to 16 puppies. 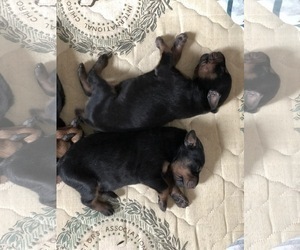 Overview: Though Doberman Pinschers are large dogs, they are very graceful and a joy to behold. These make great watch dogs and companions, as they are brave and alert to any possible danger. Coat: Smooth-haired, short, hard, thick and close lying. 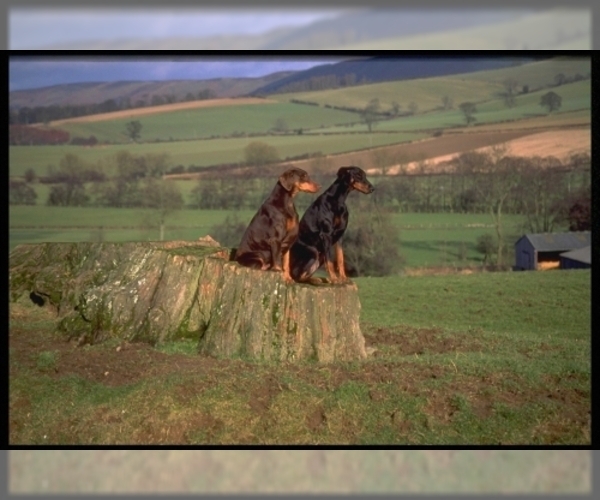 Character: Dobermans are often very loyal to one person in particular. They're brave and very intelligent, making them excellent watch dogs. Temperament: This breed gets along well with children, other dogs, and most household pets ' as long as proper socialization has occurred. 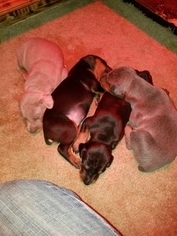 Dobermans are not friendly toward unwanted visitors, making them superior guard dogs. Care: The Doberman Pinscher should have a knobbed rubber glove used for dead hair removal. Check the claws and teeth routinely. Training: This breed requires a consistent approach, using positive reinforcement. 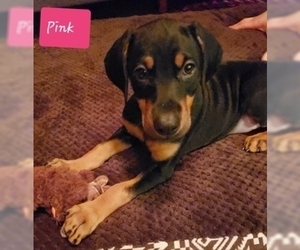 Activity: The Doberman Pinscher has great stamina, making him an ideal participant in a variety of outdoor sports. He needs more than daily walks in the neighborhood. Health Issue: This breed is generally healthy, although some problems such as cervical spondylitis, other spinal cord problems, or blood disorders are often inherited.